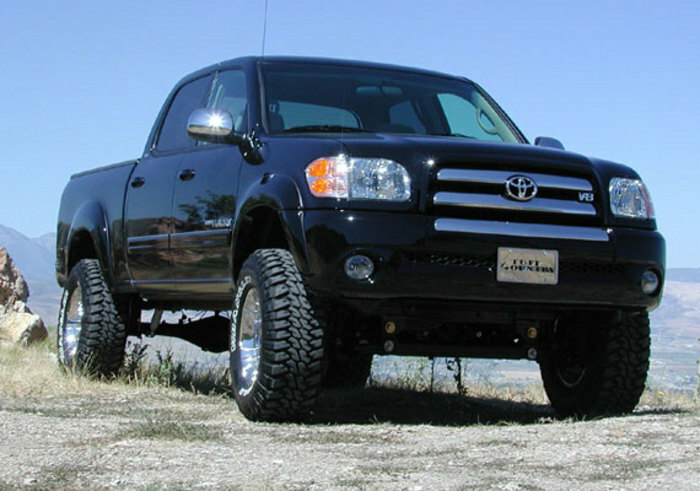 Gain additional tire clearance to fit 33" tires and get a cool new look with this Tuff Country #55900 Toyota Tundra 4.5" lift kit. 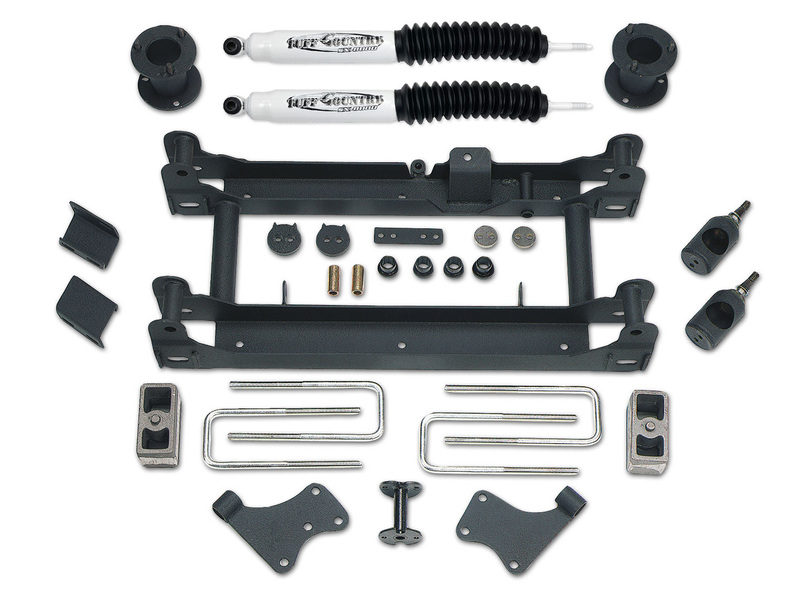 This very popular lift kit uses a combination of a one piece subframe and upper coil / strut spacers to lift the front end while rear cast iron block lift the rear. 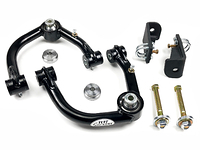 Differential drop bracket, a front sway bar drop kit, upper ball joint spacers and a steering shaft extension keep everything aligned properly. Once installed this lift kit allows use of 33"x12.5" tires. Tuff Country has been producing quality suspension products for over 25 years and backs all lift kits with a limited lifetime warranty. 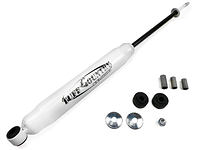 Note: To purchase Tuff Country 55900KN (w/SX8000 Shocks) or 55900KH (w/SX6000 Shocks) please select in options above. 2. Factory rims will not fit with this lift kit. A rim with a 4.75" back spacing or less is required. 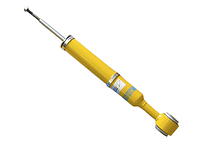 You do not have to change the front struts with this lift since they are using a strut spacer. You also do not have to change the steering knuckles for this 4.5" kit. Great kit. Only issue was steering extension rubs on fuel lines so had to re route fuel lines accordingly. 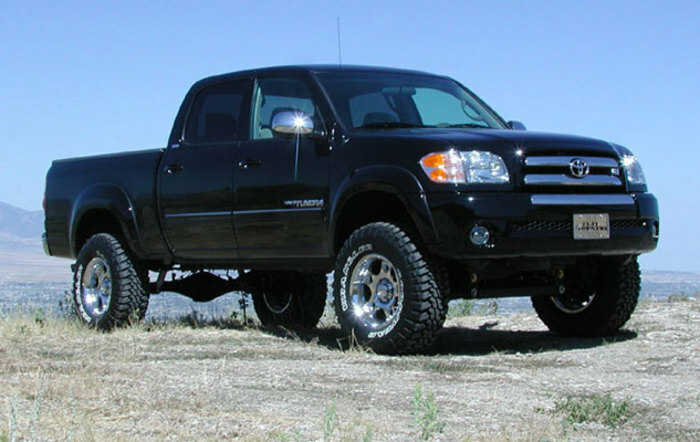 It can be very difficult to find accessories, parts, kits, for my 2003 Tundra, so it was nice to find this first generation Tundra suspension kit for my truck. Utilizing the preexisting front coil-overs and maximizing factory parts, you get the best value with this kit and installation wasn't terribly difficult for me, personally (only needed two jack stands, one hydraulic jack, no air-tools, no impact wrenches, just my socket set, pickle fork, etc... basic tools for most home garages). 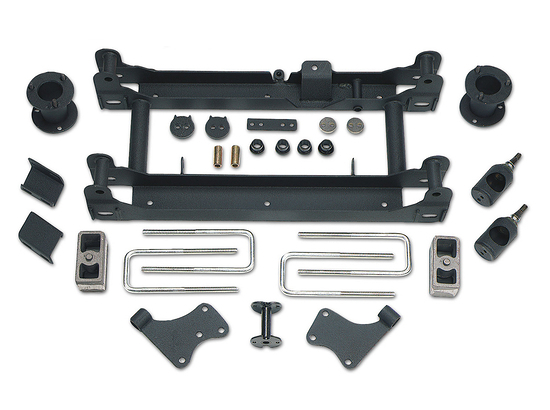 My only beef would be that the kit does not come with extended sway bar end links. The factory sway bar is at too severe an angle to meet with the OE end links (threaded rod at top, 90 degree ball joint at bottom), and it is virtually impossible to find a suitable end link in an extended or adjustable version to make it work. I had to buy OE end links and weld an extension to the threaded rod on top to make it long enough to mate with the sway bar. Also, the kit did not come with rear shocks, and your old shock absorbers are not going to have enough travel after the lift is installed. Make sure you buy a pair of Tuff Country's SX8000 (that they recommend) or some rear shock that compresses to 14" and extends to 26". 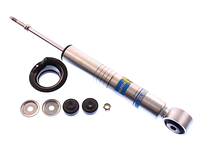 I used Bilstein's .46mm Monotube Shock Absorber (item#24-185417). If you buy Tuff Country's SX8000, be advised that you have to also purchase the rubber boots separately (don't know why the manufacturer doesn't include it, poor business choice for them). 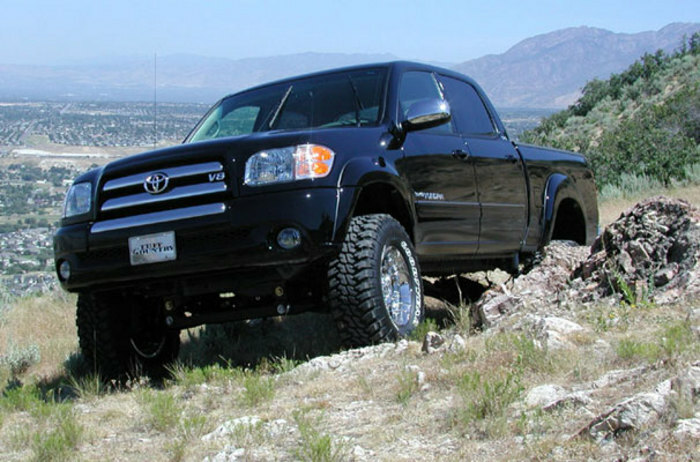 Of course, with most any lift of this size that utilizes the OE rack and pinion, steering performance is going to suffer, depending on your tires. I'm considering upgrading my power-steering sometime in the future, although I was impressed with the manufacturer taking the time to include poly bushings for the rack and pinion mounting to the lower sub-frame. All-in-all, I think my truck looks great, and after a precision alignment on the front tires, and replacing all the ball-joints and bushings (while I had the suspension all apart, I figured, "why not? "), my truck performs great. 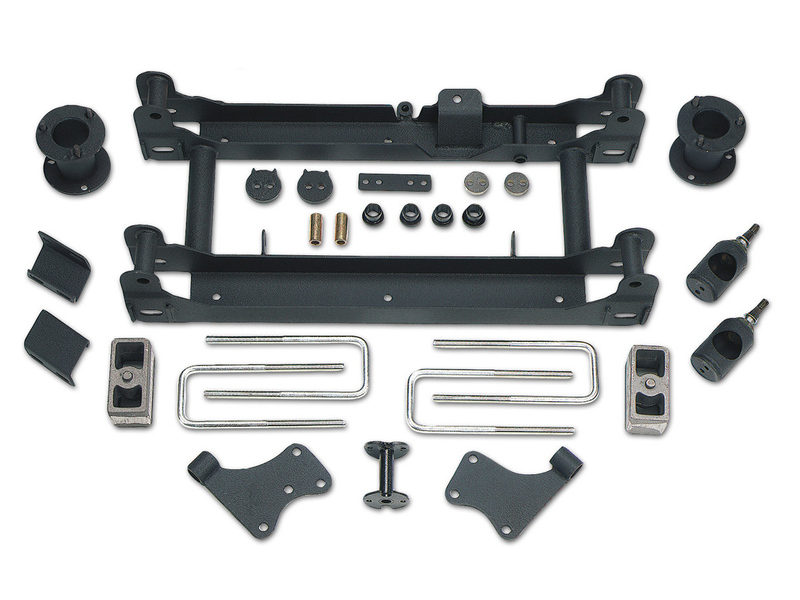 I would definitely recommend this product to other first generation Tundra owners (unless you want to fork over a few grand for a complete suspension swap out for a lift, in which case, have at that). Got this kit very quickly. My buddy and I installed over a weekend. Not a simple install, but doable it you follow the instructions. Looks amazing with the new tires and rims that where put on yesterday. This kit is doing great, install was a little challenging considering this is my first time installing anything on my own. Other than that, it is fantastic. Price is good for all that you are getting. Not amazing but it does what it is supposed to do. Does everything right. no problems with this kit yet. happy with it.